I heard they were on the move. And said these words to me. Now it's my turn to do for me. they have heard the call. They just like being together. They just like being girls. They've found a brighter day. If we all felt that way? We read that poem, all of us, and grasp what she is saying. for purple clothes and hats of red, with giant brims a-flopping. and friends you never see. and friends sill yet to be. who are there to lend a hand. and friends that treat you good. this rule can not be undone. oh, how simple can it be. in the Red Hat Society. Hey,Hey we're The Monkees !! And we got something to say! So you better get ready! We may be comin to your town! I heard that they were stunning, With nothing left to prove. And when I asked about them And how they came to be, They all laughed and they all smiled and said these words to me. "Red Hat, Red Hat, Red Hat Society All my life I've done for you Now it is time to do for me." They don't want to change the world; They just like being together. They just like being girls. They like good conversations. 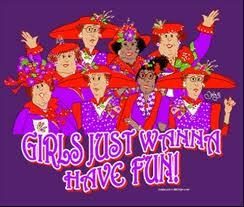 They just like havin' fun With a purple dress and a red, red hat For each and every one! I've seen them come together With a smile on every face. I've heard the sound of laughter Filling up the place. They've found an understanding, They've found a brighter day. And wouldn't the world be a better place If we all felt that way? It was written by Mike Harline to reflect the Red Hat philosophy. While other chapters sip their tea. Though you know that even best of friends must part, must part. We’ve found a better tavern farther down. Come, Red Hatters. Come Red Hatters. Hear our call. Hear our call! Have a ball! Have a ball! Sung to "Row Row, Row Your Boat"
Red Hats must be seen, what else are they for? In red hats and purple gowns, life is not a bore. So give me yours and avoid a spat—one red hat! When worn by our Red Hatter girls. Wear long rhinestone ropes and pearls. You pass by. People sigh. This is fun you just can’t buy. This is what red hats can do. so cheer her proudly, too. Yes, bedtime we are all scorning. Nothing but red hats do I see. Worn by red hatters now at play. “Red Hatters, dear, drop anchor here. Let me wear your red hat and your purple gown, too. I’d like to be a Red Hat lady, just like you. Let me join the fun crowd like your Red Hat girls! No one in a Red Hat group is ever blue. To the other sisters you are always true. If I could wear a red hat I’d be true blue, too! Below are SB Official Chapter toasts, song, cheer and Birthday Song. If you click on the titles you will get a clean version that you can print out. The "print" link should be in the bottom right corner. Social Butterflies are here to sing! hole at one end of your instrument. and amaze your Red Hat sisters! The kazoo is in the family of musical instruments called "mirlitions". These instruments make their sound by sympathetic vibration with the human voice. 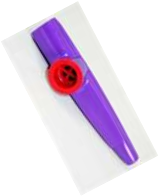 The sound of your humming voice causes the wax paper resonator to vibrate in the kazoo, and the shape of the kazoo helps amplify and project the sound. Can Cause Numbness of Lips. Never stick the kazoo up your nose. Do not inhale through the kazoo. affixed to lips and/or tongue. purse/pocket lint or belly button fuzz. fisherman's hands after a long day at sea! dyspectic foods UNLESS hiccoughing and "tooting"
is a desired effect in the music. 3. Be full of breath. 4. Be good to your Kazoo queen! CAUTION: Continued Kazoo playing can be very annoying to spouses, spectators, and anyone within earshot. She does the Red Hat Dance....how fun is this!!! 4. To hold it in. 5. To hell with it. v Orientation toward the future. The ability to anticipate, to plant, and to hope. v Gratitude, forgiveness, and optimism. We need to see the glass as half-full, not half-empty. v Empathy. The ability to imagine the world as it seems to the other person. v The ability to reach out. We need to keep our doors open to others. If friendships are not nurtured, they wither. health problems as they aged. Please no wrinkles, Please no bags. Please no age spots, please no gray. Julie Andrews Sings for the Over "50"
To commemorate her 69th birthday actress/vocalist Julie Andrews made a special appearance at Manhattan's Radio City Music Hall for the benefit of the AARP. One of the musical numbers she performed was "My Favorite Things" from the legendary movie "Sound Of Music." However, the lyrics of the song were deliberately changed for the entertainment of her "blue hair" audience. Julie Andrews recieved a standing ovation from the audience that lasted over 4 minutes and many encores! !